A first for a high-torque cast-steel coupling, a damaged bore is "replaced" with a splined-in insert to maintain original rating and restore correct diameter. 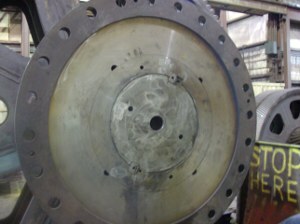 Damaged rigid half of cast steel mill motor coupling prior to repair. The part is about 6 ft in diameter and weighs approximately 31,100 lb. When the bore on the rigid half of a high-torque steel mill coupling was badly galled during a maintenance teardown, the East Chicago, IN, mill put the damaged part in the plant's bone yard. However, engineers at Kop-Flex, part of the Power Transmission Solutions business of Emerson Industrial Automation, developed a clever solution that saved the customer almost half the cost to replace the $112,000 part, which transmits approximately 10,000,000 lb-in. (1,130,000 Nm) of torque to a roughing stand. The CM-30 cast steel gear coupling connects the pinion on a 10,000-hp bull gear motor to a roughing stand on an 84-in. (21-m) hot strip mill. To transmit the required torque, the coupling's rigid half attaches to the pinion with a heavy interference fit of 0.028 in. (0.7 mm), plus two massive split-taper keys 4 x 5.5 x 47 in. (100 x 140 x 1,194 mm), each weighing about 340 lb (154 kg). Repaired rigid half installed on herringbone bull gear. According to the manager of maintenance/spares, the rigid half of the coupling, which weighs about 31,000 lb (14,061 kg) and has a bolt-hole diameter of almost 6 ft (1.8 m), had to be removed from a damaged bull gear shaft after the gearbox lost a tooth. During removal, the coupling's bore was badly gouged. "We considered the damaged part hopeless," the manager said. "We were going to replace the bull gear shaft, so we could not simply bore out the coupling to a larger size which would then not fit. 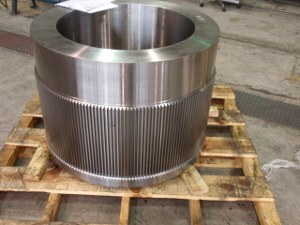 A standard coupling repair procedure would involve enlarging the bore, shrink-fitting and welding a plug in the bore, and then re-boring the center diameter to correct size. However, the rigid half is ASTM A27 cast steel, and the diametral force of a heavy interference fit for the plug would create internal stresses exceeding the limits for this part, and welding would not provide the strength to transmit the torque. Our solution was to scrap the rigid half and replace it. Rigid half has been prepared by boring out and splining the ID in preparation for shrink-fitting a splined bushing. "Months later when assessing our mill's inventory of critical spare parts, we realized we had no spares for this part, so we asked Kop-Flex for a quote on one," he added. "The Kop-Flex manager suggested we consider repairing the damaged part, so we agreed to have them assess the engineering options." To create a new bore in the part without using a welded plug, Kop-Flex engineers proposed an out-of-the-box solution using a shrink-fitted, splined-in bushing, because splined connections can transmit high torque loads. Engineers designed the splines to withstand the bending and compressive forces with an adequate safety factor. They also designed the splines to achieve an interference fit (negative backlash) of 0.015 to 0.020 in. (0.4 to 0.5 mm), along with the bushing's diametral interference. The repair bushing itself is 39 in. (1 m) in diameter, with an approximate weight of 8,000 lb (3,628 kg). The repaired part has since been installed and tested on a herringbone bull gear at a vendor's plant and determined to meet specifications. 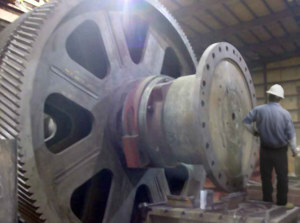 The repair saved the customer $54,000 over the cost of a new rigid half, and the repaired coupling will be reinstalled in the mill by the end of 2012. 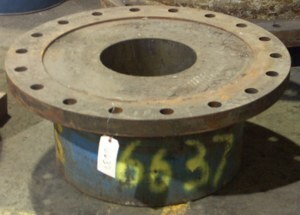 A splined repair is also an excellent way to replace worn gears on large gear coupling hubs. 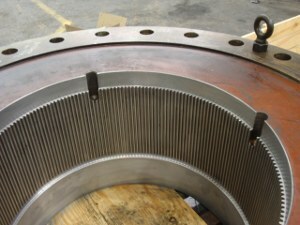 The existing gears are cut off the OD and replaced with a spline section. A repair ring with gear teeth on the OD and splines on the ID is then installed on the modified hub. This is an economical and proven way to repair large gear couplings with excessive tooth wear. Repaired rigid half installed on herringbone bull gear shows evidence of the splined-in bushing used to restore the center diameter. For more information, an interactive page-flip version of Emerson's Industrial Coupling Catalog is online at www.emersononlinecatalog.com. Printed copies can be ordered at www.emerson-ept.com.